We are starting a series about digital signature and how organizations can take advantage of using it. This is our first article on this topic. A digital signature is a mathematical scheme for ensuring the authenticity of a digital message or document. If a document is digitally signed, it ensures that it is signed by a specific person. The person who signed cannot deny the authenticity of the document. Usually, organizations keep their documents as papers which are signed by people with ink, or they save them digitally by scanning these papers. In our country(India) Digital signature has legal validity so that it can be employed in many areas where signed documents are to be saved. The digital signature can be effectively employed in customer onboarding especially companies in the financial sector. Please note that digital signatures are not valid in every scenario. To know more about where the digital signature can and cannot be used, please refer our blog post. 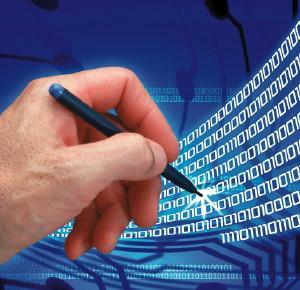 The digital signature can simplify many operations between the customers and organizations. There will be many scenarios like applying for a loan which demands customer to sign documents and submit it to the concerned firm. These are all troublesome task for clients as he has to go to the firm, fill up forms sign them and submit. It makes headaches for firms also to keep all these documents. It requires more manpower and effort. For example, the salesman has to go to a customer carrying all required forms. If digital signature employed here, the customer can log in to the website, fill up the form, sign it digitally, submit it. From the firm's point of view, all the required customer signed documents are automatically stored in their database. Now with the help of Aadhaar, CCA(Controller of Certifying Authority) has designed a simpler mechanism to sign documents digitally termed as Aadhaar eSign.With the help of this technology, organizations can provide an option for their customers to digital sign supporting documents. To know more about Aadhaar eSign feel free to contact us at [email protected] or Call us on 0484 2388285.